Gannd the Druid is a traveler in several worlds through the last three decades plus, including Greyhawk, home to many of the Dark Ones. He lives as a Druid of the Old Faith. He is a true polytheist believing in multiple Gods and demigods and the never ending cycles of Nature. Even his heraldry is representative of Knights of Greyhawk with a white snowy owl in display on a black field with added elements. He serves the community around him assisting when he can. He is usually found running a small grove of those on the path, teaching them the old lore and wisdom. White robes and magic are his trademark. He does have black traveling leathers and other garb when needed. He usually has an array of bladed weapons at his disposal. Many of his friends will intercede on his behalf so he doesn’t have to use them in anger. He does well at giving Last Rites, though. He is a Master Class Crafter in leather and brewing mead… when he finds the time. You never really know what is in the folds of his robes and his pockets. Mead, whisky, baubles, along with wands and bladed weapons have all appeared at times. 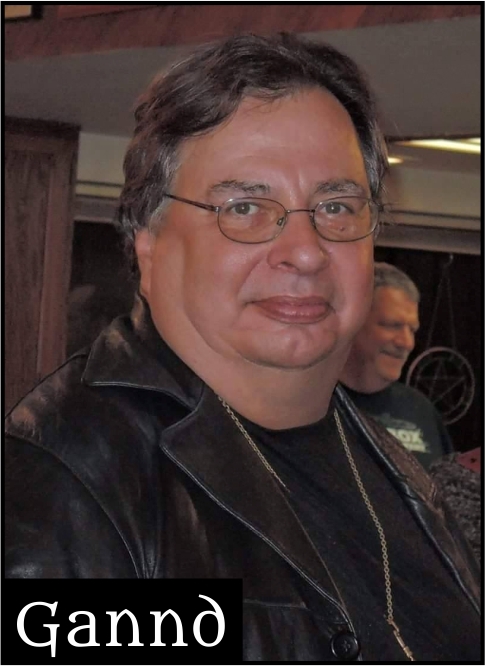 Gannd the Druid (aka David Foster) has been attending and helping out with Dark Ones events literally for several decades… For example, he was ‘Hotel Liaison’ for the first DarkCon in 1995 and ‘Fan Guest of Honor’ at DarkCon 1999. For DarkCon 2012 he created the leather patches for the black leather VIP trench coats too. He has attended all of the DarkCons. On a much more recent note he has helped with party themes like the seven ‘Elder God Altars’ he created and brought to the 2016 April Party. He also donated a real sword and scabbard as a raffle prize. He has donated several swords for upcoming raffles and was also been a heavy donor for the Dark One’s Bar project. Currently living in Tucson he has not been able to help as much with some of the set ups and work parties but is a crafter doing leatherwork and silver repair since 1980 in the SF community sponsoring masquerades, etc. You may see him more often in white robes than black as he is also a real neopagan Druid priest and has performed a great many weddings and funerals for the past 35 years of being ordained. He is also a Master Laurel of the Arts in the Society for Creative Anachronism, and member of House Staghold which is the SCA household for many other Dark Ones. Say hello when you see him. He is quite friendly and knowledgeable with three technical degrees working for Raytheon with the latest advanced technology. He is well travelled, being a U. S. Navy veteran.